Love these! I put them on the "to do" DIY list. Looks like you could do some cool ones with colored paper, in whatever color scheme you'd like Thanks! I love those! They might just bump some projects off my to-do list! I will start making some right now. Thank you. And colored paper is a good idea. I am thinking orange maybe. These are sooo cool! I have also added to my to-do list. I will add these to my wreath. Oooh I'm definitely trying this. I was wondering this week what fun things I could make to decorate my open stairwell for Christmas. These are perfect! I can't wait to make them in some bright colors and sizes! Well, at least I could cut circles really fast. Did you? these are beautiful! i can't wait to make some!! LOVE this. I am doing it, RIGHT NOW. I decided to use magazine pages though. looks cool! I am going to do pages out of a dictionary next!!! I'm exited by these. thanks! Thank you! These are so cool! I remember making them when I was in grade school but lost the pattern somewhere along the road in the past 35 years. I see a ornament making session with our boys! Awesome idea - fiddly and time consuming, but it looks all worth it! Off to make some now... Thanks! That's great...I ran across this same project a few weeks ago and did a couple of circles to see how it would turn out. You're right...very time consuming and almost impossible to get the point really pointy. Yours looks smashing! Looks awesome and totally makes me want to try with some Christmasy papers! I love it...you're right, it took forever. I think I mastered the pointy thing by the very. last. point. I want to make another one though! ps: i will link to this eventually too! So cute, but wow, that seems time consuming! Have to try it though - it's going in my "Fun and Creative ideas" folder. Extremely freakin' awesome. I'm making one with embossed metallic paper in an alligator print. OK, maybe more than just one. Lovely! Thanks for the tutorial. I'd love to see some in some colored origami papers! This is wonderful! 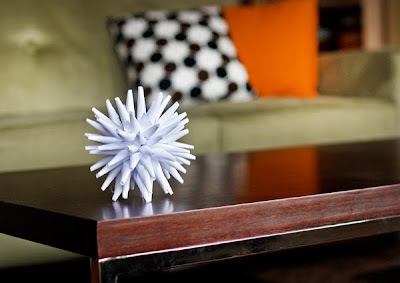 I am definitely trying this for my coffee table. P.S. Ladies, why each time you recogonize the stuff, you should make a comment "Oh, I was doing it when I was a child", "My auntie did that for me when I was 8","This was my project at preschool", etc... You know the stuff, but nobody asked you to tell that! Come-on, you don't need to do "Madame je sais tout" (sorry, I am french). I've never seen this before! What a great idea! And the rubber band is a neat trick. Thanks for sharing! These are mega-cool. I am thinking of making these really big. Thanks for sharing! Do you think this might work with fabric.... perhaps using a little starch to stiffen the fabric?? What other modifications might need to be done?? OMG. I am so making these this weekend!!! Thanks! after reading your post, i saw these on the front page of etsy. look at those points! and omg... that price... for one! i think i'll try to make my own thank-you-very-much. :) thanks for the tutorial! Elisa, fabulous video. Thanks! Jennifer, those are so cool. I'm inspired to make my points pointier. Anonymous, I haven't worked much with stiffened fabric, so I'm not sure how stiff it can get. You might have to experiment with a small piece and see how making a cone goes. Other than that, I don't think there's anything you'd do differently. I just recently made one of these with my daughter, but in the German foil style. The teacher at a workshop, a friend of mine from Germany is able to get a double sided foil with a good thickness which she can find only in Germany. The one we made has a different color on each side, so really lovely for Christmas, a great project! Oh, Debbie M - regular foil might work, though not as sturdy. You don't need glue, and no need to measure out even. We attached each piece with double sided tape. Would be so cute as a HUGE thing, eh? I prefer the yours vs pointy one! I find rude the comments refering to other similar finds. leave the magic intact for other! 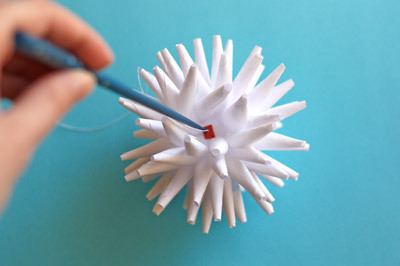 Hmm, I've had handmade paper ornaments on the brain, and a version of this one may be just right! Thanks! This looks really cool and I'm going to try it. Before I start, I wanted to ask if the glue is necessary and if so, at what point and where do you add the glue? thanks! I`m soo gonna try this! Looks really cool. So lovely! Next time I have "time" I'll have to try this! Thanks Jessica! I always love your tutorials and this one is no exception. I'll be linking to it tomorrow. DIY.... Don't mind if I do :) Can't wait to try these. If I start now I could have my technique perfected by Spring. These would be fun for some of the partys I will be planning! Thanks for the GREAT tutorial. With Christmas coming up and work slowing down, I've been spending my lunchtimes and afternoons making random 3D crafts. Since I'm all about the 3D ornaments, my coworkers have been sending me multiple links and this has got to be my favorite one. I'm going to attempt it in the next few days. Thanks! Hey, thanks for reminding me of these. 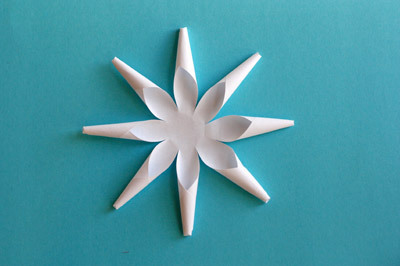 We used to make these as kids, however, using gold or silver foil instead of paper. Very elegant!!! Thanks so much for sharing. Thank you so much for posting this; it is such a lovely idea! I've been collecting 5" and 6" sandpaper circles from work because we go through them like crazy, and I didn't want to just throw them away. Now I have approximately 150 pieces of sandpaper and was unsure how to repurpose them in a crafty manner until I saw this post. Fingers crossed it works; they are thicker then standard paper. Not sure what I'm doing wrong. The thread keeps breaking and the rubber band won't hold the down the paper. Anyone else run into these issues? I love these! Thanks so much for posting the tutorial. I've already made two using my old IKEA catalog for colorful paper. I'll probably make more and maybe make a garland out of them or hang them in the front window. I think I'll try a bigger one, next. I am always in awe of DIY and this is really impressive! Thanks for the tip. Great. And Alison, good work! 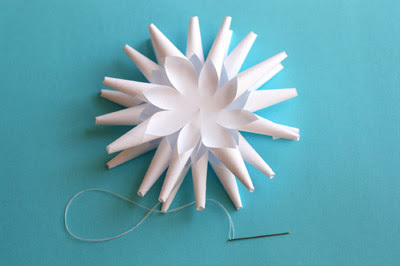 I absolutely LOVE this paper ornament, and can also be used for wrap decoration!! Lovely! How generous you are with your wonderfully creative projects. Thank you.... this dimensional star is great. I just love the edgy look!!!!!! Love your blog! Thank you! SO interesting and beautiful. I am featuring this at somedaycrafts.blogspot.com. I have too much going on to be able to create these for Christmas, but I think they'll be just as cute in red, pink, and white for Valentine's Day. im ALMOST done with my first one. i've finally gotten the hang of it. i'm thinking of making a few more in different sizes and spray painting them silver. These look amazing. Love that paper + such a unique design creates something like this modern artwork. Oh my goodness..I can't believe that's made out of paper! Amazing! I have four very happy little girls getting their gluey pencils stuck in the points having fun making these. They will no way be a lovely clean white at the end but the effort is worth it, thanks! Having finished three of these I finally figured something out: the trick to the points is to not place the point of the pencil at the edge of the paper when rolling. Pace it 1/16 to 1/8th inch from the edge. 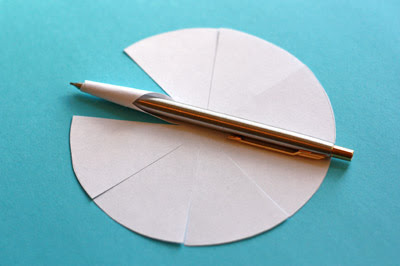 Then hold the pencil at a slight angle so that you have only the tip touching the table when rolling. Don't press so hard that you break the pencil point! Darn, I found these just a few days too late! That's ok. They look so fun, I'm going to make some when I get home anyways! Maybe I'll make some red and pink for V-day. I'm thinking about sticking a little round bead at the end of each spike... especially if they're not super pointy, I bet it'll look pretty neat, and hide the stubbiness of the points! Thanks for sharing this awesome project!! I made one yesterday out of zebra wrapping paper. Everyone loves it. And for a wedding...I don't know perhaps if all the bridesmaids and groomsmen helped. Wow, these look just too cool! 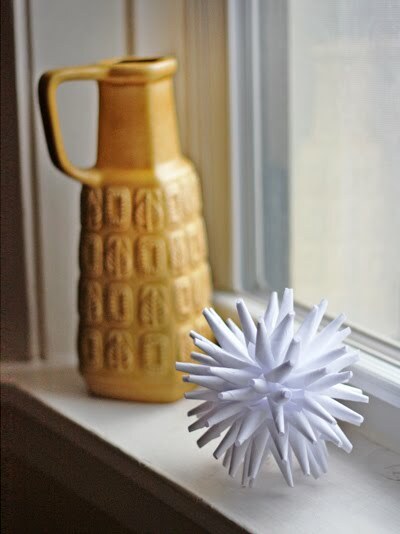 I have this linked to my decorative balls post too today - nice job! Ezeket a kis papír kütyüket gyermek koromban Édesapámmal csináltuk.Úgy,hogy különböző szineket fűztünk fel egymásra és igy akasztottuk fel a fenyőfára. Csillogó papírból csináltuk, mesés volt amikor egy kicsit fordult. My Grandmother made these for years! They are called porcupines. We helped make them with her as children. She made huge hanging ones and ornaments for the tree. Én ugyanezt szoktam elkészíteni, csak alumínium fóliából. Gyönyörű!! Your blog really inspires me! Hi Marcella, feel free! As long as people stick to the permissions info in the left sidebar, they can link away. I made some tiny ones at work with some illicit printing of Marimekko desktop wallpapers, the bottom of my coffee mug, and a gluestick. Quite possibly the perfect way to spend a boring & slow workday. Im starting mine right now, they look awesome!! yea! S-P-i_k_e_Y B-A_ll!! thats whta i calle dit aye! i called mine S-p_I-k_e-Y ba_LL 1.55!!! I KNOW THE NAME IS RaNdOm!! Before I waste my time...what do you think about using coffee filters? They're a circle and already marked in segments via the pleat. Would they be too thin? I know the color isn't pleasing but it would be good to get the hang of it maybe. Awesome job on the tutorial. Thank you. Ooo, interesting. I bet it would work. We (me and 7 year old) have loads of fun. Thank you! I found it easiest to use little brads to put the papers together. :) Then if the brads don't go all the way through all the papers I use two brads and some glue. I've made some pretty red polka dot ones, glitter damask ones, and I've also got some dinosaur paper I'm excited about haha. I was totally into those coffee filter pomanders, but they felt a little too wedding like for the event I was doing. This so much simpler,and unespected. I am going to put a wire on them and put in vases like flowers. i want to figure a way to turn them into votive holders. I love these. I have made them before, but out of tissue paper and given them away. My stepmother still has one or two left from over 15 years ago. 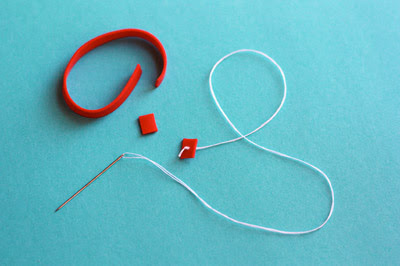 Your rubberband idea is so great and solved the problem I always had with finishing them off. They look really good with different colored tissue papers too and I have seen them done with newspaper. Scraps of Christmas wrapping might be fun too. Maybe you could use an apple slicer as a template-- it is a circle and already divided it into 8 even "slices". No measuring! I don't have a newsletter, but you can subscribe to get posts emailed to you. t took me @ 1 1/2 hr. to make one! I traced 2 CD's on copy paper, marked the division lines on each and made 5 copies on the printer. 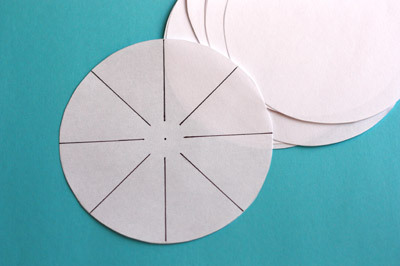 Then I stapled around the circles to cut them out at once. I cut a curve, then the line and repeated this until all cut out. I think this was a real time saver. It would look cute with the tips dipped in glitter. I make hundreds of these and sell them. The lady with the coffee filter idea is not far off, the original Polish Stars were actually made of tissue paper, to let the light shine through. They are not as easy to make as it sounds, and my way is quite different, but they are beautiful!